Hot dogs, pizza, pretzels. I think dumplings are as much an iconic New York food as these ubiquitous street eats. Got a buck? Then five juicy pork and chive dumplings are yours at Chinatown’s Prosperity Dumpling. For a few dollars more, Xi’an offers a plate (or bowl, in soup) of fat, spicy and sour lamb dumplings. And Mimi Cheng’s elevates cheap and cheerful dumplings by using organic vegetables and meat in their bright East Village cafe. Making a batch of dumplings and freezing them* is always a good idea. It only takes an hour to make about 40, and cooking them from fresh or frozen takes 10 minutes. But they never last long in my freezer. 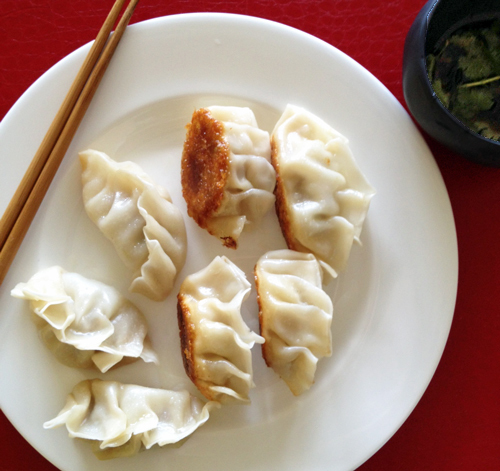 My husband says my potstickers are one of his favorite foods, so it makes an easy work-from-home lunch. I learned my best potsticker recipe from the adorable Dumplings Sisters, and they couldn’t be more foolproof. Sometimes I add extra ginger, sometimes I leave out the bok choy, or make them with chicken instead of pork – just use this recipe as a guideline. My preferred dumpling wrapper brand is Twin Marquis, made in Brooklyn with no nasty ingredients. And I like to serve these potstickers with a dipping sauce of soy sauce, rice vinegar, sesame oil and cilantro. Watch the video, get the recipe here, and get dumping! * To cook potstickers from frozen, don’t thaw them, simply bring 3/4″ of water to a boil in a wide pan with 1 Tablespoon of vegetable oil, then add the frozen potstickers in a single layer, put a lid on and cook over high heat for 3-4 minutes. Remove the lid and continue cooking for another 8 minutes, or until the water has evaporated. The oil in the water will coat the dumplings and crisp the bottoms once the water has evaporated.